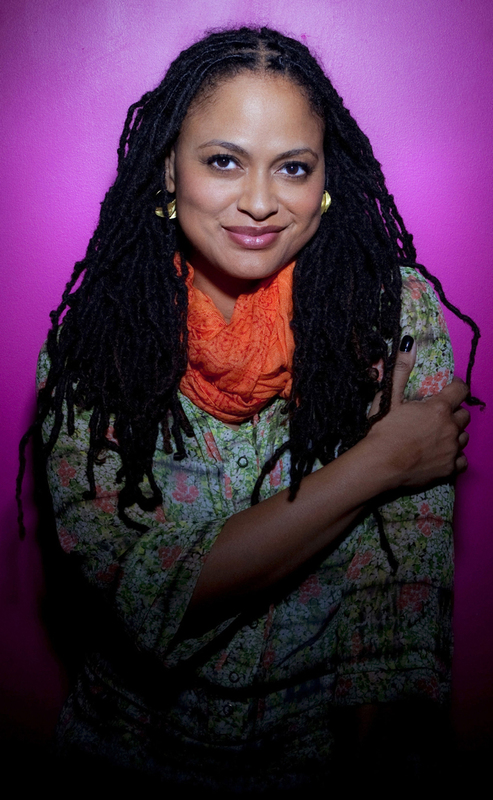 Where is that new generation of black filmmakers we keep looking -- hoping -- for? Maybe it's TrustMovies' own too-blinkered view, but he isn't seeing nearly as many nor as adept a group as he had once expected. Barry Jenkins' easy, charming Medicine for Melancholy back in 2008 seemed to indicate a new voice, but Jenkins doesn't appear to have done much since then. Likewise Tanya Hamilton's Night Catches Us (2010) offered some good opportunities to explore Black/U.S. history that were not always used as well as they might have been, and though the movie appeared promising, Hamilton hasn't made anything since. For my money Lee Daniels would seem to be as competent and creative -- if awfully given to exploitation -- a filmmaker as we've currently got. Until Denzel decides to direct again, at least. Now comes a new movie by a black filmmaker, Ava DuVernay (shown at left) that tackles current and almost-middle-class life among blacks, with the emphasis on the women: two sisters, Ruby (Emayatzy Corinealdi, shown below) and Rosie (Edwina Findley) and their mother Ruth (the veteran actress Lorraine Toussaint). It is Ruby, however, around whom the movie revolves. As it opens, she is being told by her hubby Derek (about to go into prison for what looks like some years to come) that she should leave him and start her life anew. We don't hear Stand By Your Man on the soundtrack, but this is exactly what Ruby decides to do, and unfortunately the resulting film makes her look a bit more like a clueless dope than a supportive, caring wife. Derek is played by the very hot young actor Omari Hardwick (below, left), so for the sexual quotient alone, one can understand Ruby's decision. Also, as DuVernay digs deeper into family history, we see that there's a rebellious streak in both daughters that comes from their too-constricting mother. Yet the filmmaker has decided to leave out all past history between Ruby and Derek, so that we can only wonder why this supposedly intelligent young woman who planned to become a nurse would forsake everything to rally around a man she so clearly does not know. Further, by the time the filmmaker decides to show us what happened to land Derek in prison, it's something so basic and obvious that Ruby's standing by him seems even more loony. Consequently the movie appears to grow more oddly manipulative as it goes on. Why does Ruby continue on this path? Does she want to show her mother up as wrong? Or prove to herself that she can change her wayward hubby? We get some hints here and there, but not enough to finally put us in Ruby's corner -- where we need to be, if the movie is to work on any level. 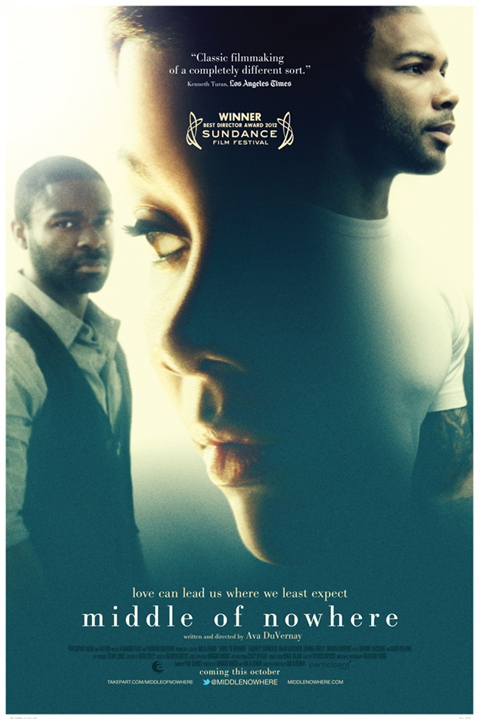 This problem becomes particularly apparent when the woman finds herself attracted to a bus driver on her local route (David Oyelowo, above, left, and below, right), who is clearly smitten with her. As writer and director, DuVernay paints her heroine into a corner from which there seems to be no escape. There's a long voice-over speech at the finale which left me not a little confused. I asked a couple of critic compatriots (one black, one white) what this meant: One couldn't even remember the speech, the other seemed as confused as I. The acting is as fine as can be expected, considering the confusion on hand. 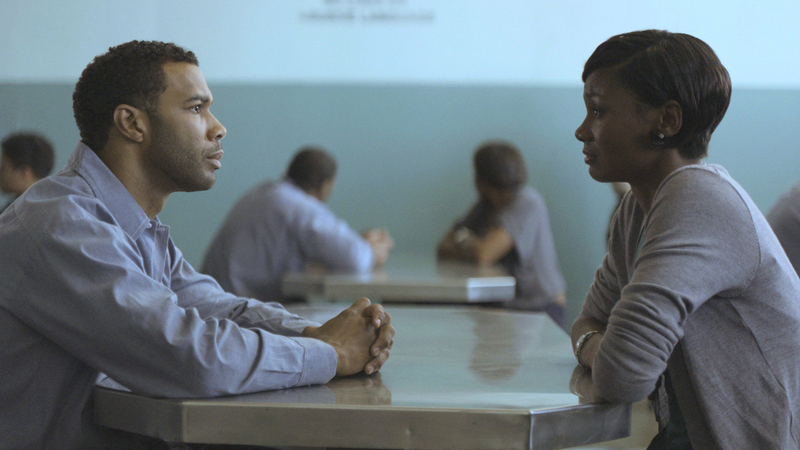 Ms Corinealdi is pert and thoughtful, and Mr. Oyelowo is particularly good. When you compare his performance here with that of The Paperboy (which opened last week), you'll quickly see the surprising range of which this actor is capable. But what, I wonder, is the filmmaker trying to tell us? The fact that life is hard -- emotionally and economically -- for everyone we see. That's believable enough, and at this point, things only grow harder from year to year. As for these women, their plight is every bit as problemed by movie's end as it was at the beginning. If anything, it's worse, and so far as we can see, in too many ways, Ruby is as much responsible for her plight as is anyone else. The film, from Participant Media and running 99 minutes, opens this Friday, October 12, in New York City (AMC Empire 25), Los Angeles (Sundance Cinema @ Sunset and Rave 18--The Bridge), Atlanta (Landmark Midtown), DC (Regal Gallery Place) and Philadelphia (U.A. Riverview) -- with more cities to come in the following weeks. Click here to see all currently scheduled playdates, with cities and theaters.